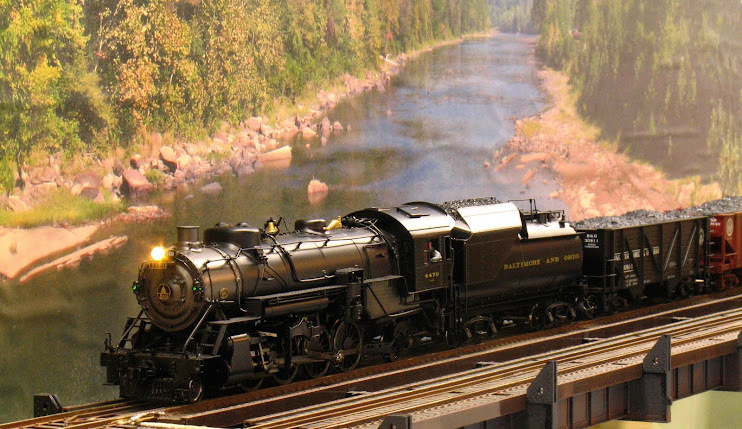 2-Rail O Scale Railroading: N&W 611 Lives! N&W Class "J" 611 is back in excursion service. Even though I am a B&O modeler, I think that the "J" was the best streamline steam loco of all time (maybe I'm biased because of my beginnings in Lionel and Lionel's model of the "J"). It's lines are sleek, clean and modern; and the glossy black paint job doesn't hurt either. The NYC Empire State Express Hudson and the Santa Fe Blue Goose are similar in design concept, but not as well executed. The B&O P7d locos follow suit, but have too much of an art deco look to them. The SP GS-4 is a good looking engine too, but it's a runner up to the "J". So the 611 returned to it birthplace Roanoke, VA this past weekend after being in North Carolina for restoration. I missed the "J" the last time it was under steam in the late '80s - a father with a young family and all that entails; I wasn't going to miss it this time. In addition, I have never really seen a large loco under steam before; the Chinese SY class Mikado when it was delivered to the Valley Railroad in Essex, CT and the CP Pacifics at Steamtown in Vermont (before it moved to Scranton) being the largest heretofore. So I drove down to Roanoke on Saturday, May 30 to catch the 611's return. I set up initially at ground level in the viewers area but, as the day wore on and the sun rose higher, I decided to set up on the glassed-in overpass over the tracks that connects the Hotel Roanoke with downtown. This provided an aerial view of the 611 as it came into sight, but the intervening glass degraded the video slightly; to say nothing of the extraneous sound. You can judge for yourself in this rough cut of the 611's arrival. I've done nothing with the video except cut out extraneous footage and enhanced the sound a little to bring out the whistle and suppress ambient noise. 611 will be touring around Virginia every weekend between now and Fourth of July weekend; starting in my neck of the woods, Northern Virginia, this coming weekend with three runs between Manassas and Front Royal. I've already picked my viewing spots for these runs and, hopefully, I will be following the 611 until the 4th. Not much model railroading will get done this month!